Hard wearing 12mm thick vinyl mat for reduced fatigue while standing. Black mats with yellow bevelled edge borders. Other border colours available on request. Impervious to many industrial chemicals and easily cleaned. Working with machinery can be a potentially dangerous job, especially when you are working on your feet all day as it can cause fatigue which leads to a lack of focusing and that is when accidents are most likely to happen. Our workstation mats are ideal for industries such as manufacturing; the hard wearing 12mm thick vinyl mat reduces fatigue while standing, helping to keep concentration levels high when working. They are impervious to many industrial chemicals and easily cleaned to ensure they have a long life span. 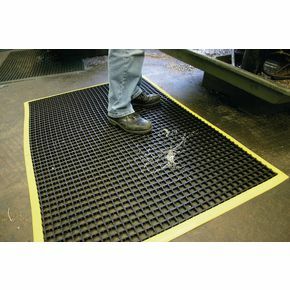 Another safety feature is the cross-ribbed slip resistant surface further helping to reduce workplace accidents. They are black mats with yellow bevelled edge boards for extra safety; however other border colours are available on request. Our workstation mats are a great way to keep your employees alert and comfortable throughout the day while they are working on their feet; they are available in two three size; 1000 x 1500mm, 1200 x 1800mm or 600 x 1200mm. They come with a 12 month guarantee and FREE UK Delivery.